Pierre was born in Dennery, in the small Caribbean island of St Lucia which has a population of just under 200,000 people. Compare that to Birmingham in England, for instance, which is nearly five times the size of St Lucia. 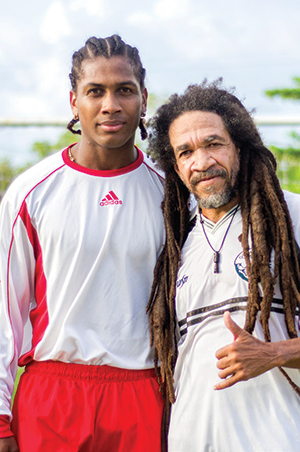 He began his footballing venture with Vieux Fort, a comprehensive secondary school which has a reputation of churning out some of the island’s biggest sports stars. In 2010, after developing well at Vieux, he made the switch to Trinidad & Tobago outfit W Connection. However, if we skip backwards just a little earlier within that month – Pierre was actually on trials with various top level European clubs. He was trialling for Premier League side Stoke City, and has previously had trial spells with Arsenal, Tottenham and Manchester City. Plus, it was reported in the St Lucian press that several Spanish teams were tracking Pierre’s progress. So, not bad then? Within two years of playing with W Connection, who lost the CFU Club Championship to Caledonia AIA just short of a few weeks ago, the midfielder made a huge move. In August 2011, he went on yet another trial. This time with Italian side Genoa, and a year later, in April of 2012, he made the deal permanent. This was, understandably, massive news for St Lucian football. He became the first ever St Lucia player to sign for a major, top level Italian club. And through this deal, Zaine could become the most expensive transfer ever for a teenager from the Caribbean, depending on future achievements and accolades. And throw his new Puma contract into the equation, then you can clearly see what all the hype is about. W Connection have also been praised, for their impressive youth system as they keep on producing talented youngsters who are going onto bigger and better things. Infact, Connection could really benefit from Pierre’s move and their developing youth infrastructure as Genoa are likely to come back for more. The Trinidad club will be looking to earn a considerable financial boost. It’s a big next few years for Pierre. He’s done so well, and now he’s based at a large, expanding European club he won’t, certainly won’t, be wanting to make any sort of mistake. He has the ability, and many are sure he will be a worthy recruit. Including myself. In terms of the international scene, at 18 he has five caps to his name. He’s tasted World Cup qualifying, following his debut in 2010, and is becoming a key player for his country.